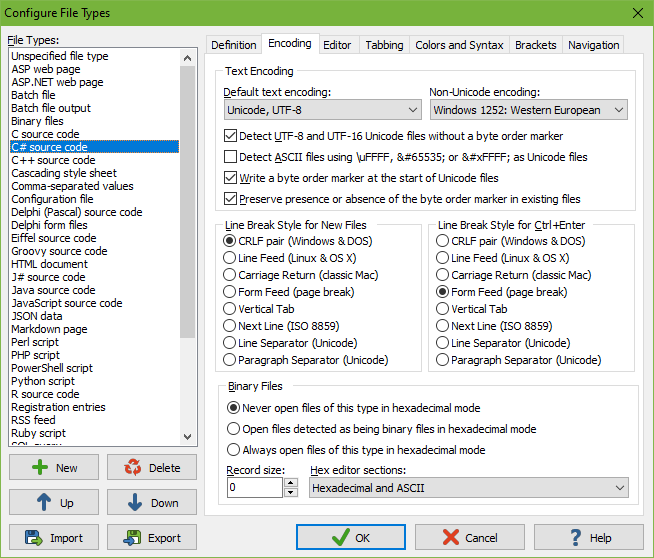 With EditPad Pro you can edit any kind of text file, not only plain text documents with a .txt extension. HTML files for a web site, XML data files, scripts in languages like Perl or PHP, source code in C#, Java or Delphi, INI configuration files, etc. 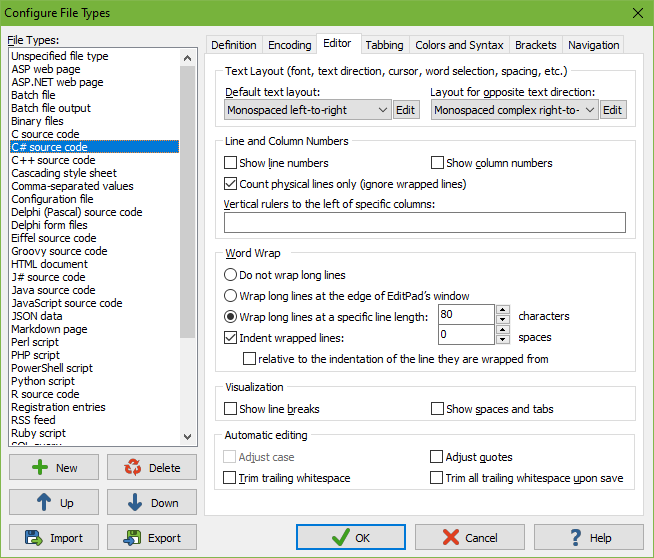 are all plain text files that you can easily edit with EditPad Pro. This makes EditPad Pro a very useful text editor for writers, webmasters, programmers, system administrators and just about anybody using a computer running Windows. Though EditPad Pro itself requires Windows, you can easily edit UNIX or Macintosh text files. After installing EditPad Pro, it will automatically recognize the file types listed below and use the predefined editing options for them. 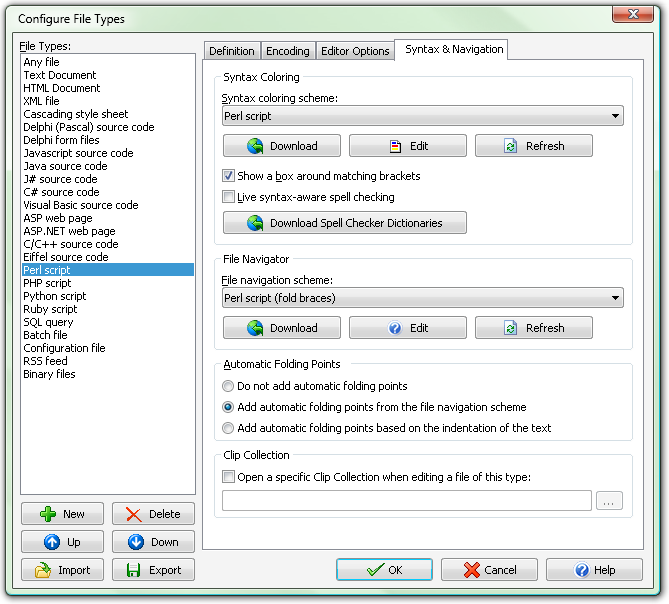 All other files will be edited using the default options until you configure those file types yourself. Obviously, you can change the editing options for all predefined file types, as well as the default options for unrecognized files. Making EditPad Pro recognize other file types is a piece of cake. Simply pick Options|Configure File Types in the menu to create a new file type, and specify the file extensions used by files of that type. Choose the editing options you want for the new file type. People do edit different files differently. When writing a plain .txt file such as a letter or a memo, you may want to use an editor that wraps long lines at the edge and marks misspelled words. When editing an HTML file for your web site, you probably want HTML tags to automatically get a different color to make them stand out (which we call syntax coloring or syntax highlighting). When programming in Java or C#, you probably don't want any word wrapping or marking of misspelled words, but you want auto indent and line numbers instead. EditPad Pro takes care of this automatically. You only need to tell EditPad Pro once which editing features you want enabled for a particular kind of file. And you can easily add your own file types, or delete predefined file types. Simply pick Options|Configure File Types from the menu. EditPad Pro's Tools menu for running external programs for processing the file you are editing, or other tasks, also adapts itself to the type of file you are editing. If a tool does not apply to a file type, it will not be visible in the menu. Just tell EditPad Pro that the C# compiler can only compile .cs files, and it won't clutter up the menu when you're maintaining a .cpp file. "I just think it's a swell editor. It pales UltraEdit and many others. [...] Worth taking for a test drive!" "I'm constantly pleased with the efficiency and power of your wonderful program. Please keep up the great work."